Shravan received financial support for his studies under "Education for Individual" from Indiasudar. Indiasudar has decided to provide 3 weeks Yoga classes at Govt Hr.Sec School, Renganathampettai,Karur in the month of June 2014. We seek your kind support for this project which really makes the student perfect with All-round fitness , Increased energy , Stress relief etc. Lat year too we have conducted this event. This school’s academic performance also is available in this mail. We request our members to come forward and serve the society. You can sponsor full / Partial. Academic assessment -Velusamy S – DEEE. am writing to submit academic assessment of the student Velusamy S who’s being supported by India Sudar. Academic assessment -Siva Priya – Diploma in Textile. I am writing to submit academic assessment of the student Siva Priya P who’s being supported by India Sudar. Family Background Parents are working in power loom. Mother is patient. Monthly income 4100 Rs. They have own house. Indiasudar with help of our partner organizations (P04- TCE-CRESCENDO (Alumnis of TCE, Madurai) and Helping Hands ) deployed 10 teachers to 10 learning centers of Thiyagam Womens Trust,Madurai. Our students from those learning centers wrote HSC and SSLC examinations and all got good marks. Here are the mark details of our students. On behalf of India Sudar we wish them all the best. We sincerely thank our partner organizations TCE-CRESCENDO and Helping Hands for their ever green support. We submit our sincere thanks to Ms.Amutha shanthini and Mr.Selvam ,Thiyagam Womens Trust for their active cooperation and updates. 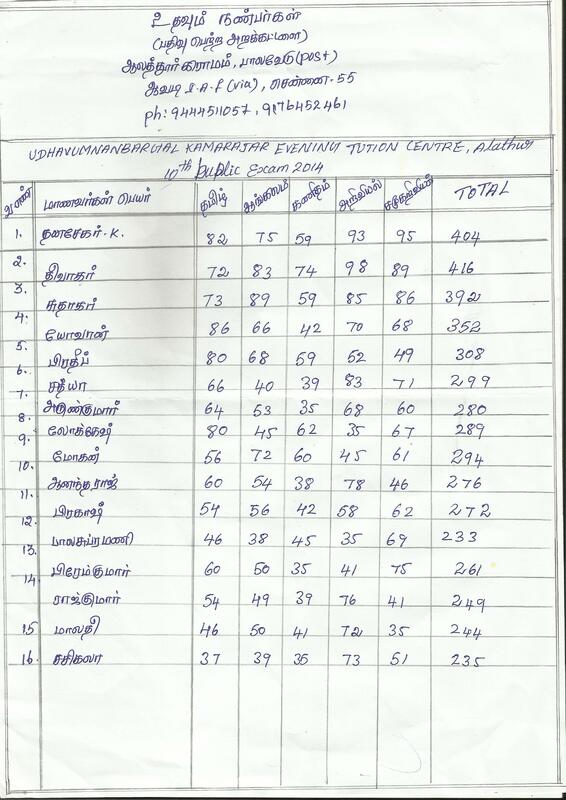 Thanks to all..
Hi folks.. attached the 10th result from Udhavum Nanbargal, Alathur (onsite code -OTN19). We, Indiasudar, wish those students for their achievements. And, a heartfelt thanks to all you people for your continuous support. Expecting the same in the coming years too. Family Background : Father is into cattle breeding, which is the only source of income. 2 elder sisters are studying in BSc and BCom. Mother is house wife. Background verification of the student is done by India Sudar KA team members.